This is an example of an Excellent+ condition Big Loo. He is supplied with many original accessories and the balance are exact reproductions. All accessories that came with the 1963 Big Loo are present in one of those two forms. At the bottom of this page are many detailed photos. His rolling base still has the original 4 wheels and they are all in great shape. This is the one area that many times is damaged or has been repaired. The wheels roll freely and the underside has no cracks whatsoever, a rarity in Big Loo Robots. It’s obvious that he was never ridden as many children attempted to do. On the topside, the gold detailing and pedestal trim are exceptional with no paint loss. Big Loo’s gold sections were the only areas painted at the factory. The maroon legs and green torso/head get their color from the paint being mixed directly into the injected plastic. The non-gold areas of the rolling base shine in their awesome maroon color and look almost brand new. On top of the rolling platform you can see the original compass which is in absolute mint condition. Not only is the glass without chips or cracks but the needle has no rust whatsoever. 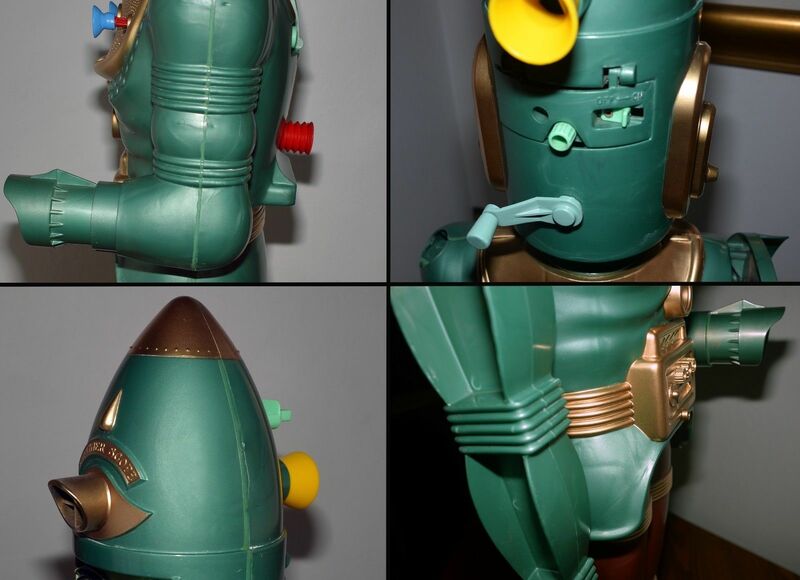 In his equipment bay, the green Space Rocket Launcher is a reproduction. However, the spring and yellow Rocket itself are original to the Robot. The Rocket’s fins exhibit no major nicks or cracks. The Rocket’s black soft nose is still supple and without cracks. Together, they present beautifully. Moving up from the rolling platform, we find Big Loo’s maroon legs without dings or scratches. They exhibit the same shinny luster that gives them that minty look. The gold detailing at his accordion joints are perfect and without paint fade. At his mid-section, the control panels looks great and without paint loss. The water squirter port contains a perfect reproduction of the red Water Ray. Although the Water Ray looks exact, it is non-functional because it was recasted ib solid resin. It does however, have a second part to simulate the green tip and looks very realistic. The gun barrel arm shoots the red Space Sphere balls with plenty of power and all 4 red balls are original and in mint condition. These are the 1963, slightly punky feeling, proper grain, real Space Balls. Big Loo’s swinging arm works great and the grasping claw is fully functional. The control rod that operates the claw is without rust. He can easily hold the supplied reproduction Moon Grenade which together, makes a great display. 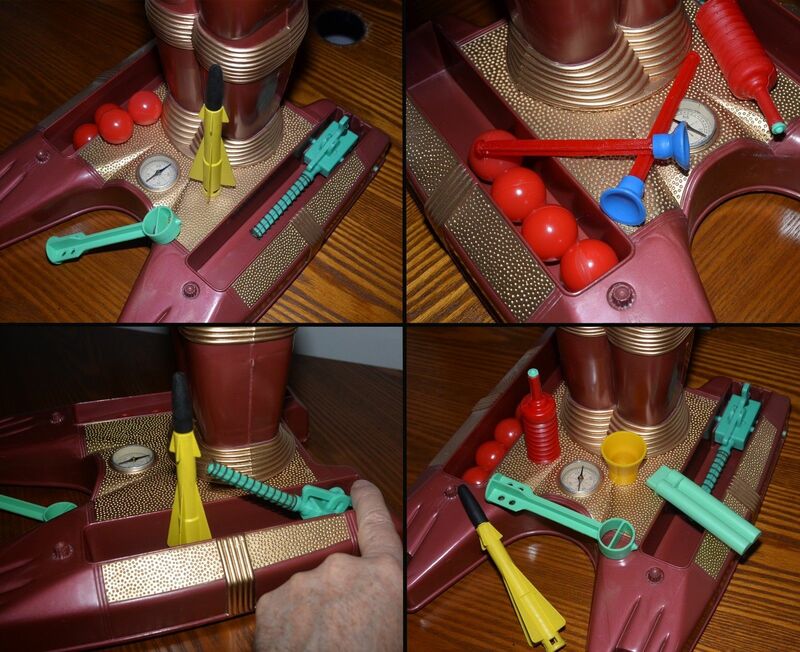 At Big Loo’s chest plate, the two dart holders are fully functional but the darts themselves are perfect reproductions. They have light blue tips which are solid resin. As a side note, the reproduction darts actually look better that the surviving versions as the 1963 rubber tips are now so old and brittle, that they almost always appear as deformed because the rubber shrinks and hardens over time. The gold detailing at the chest is superb. 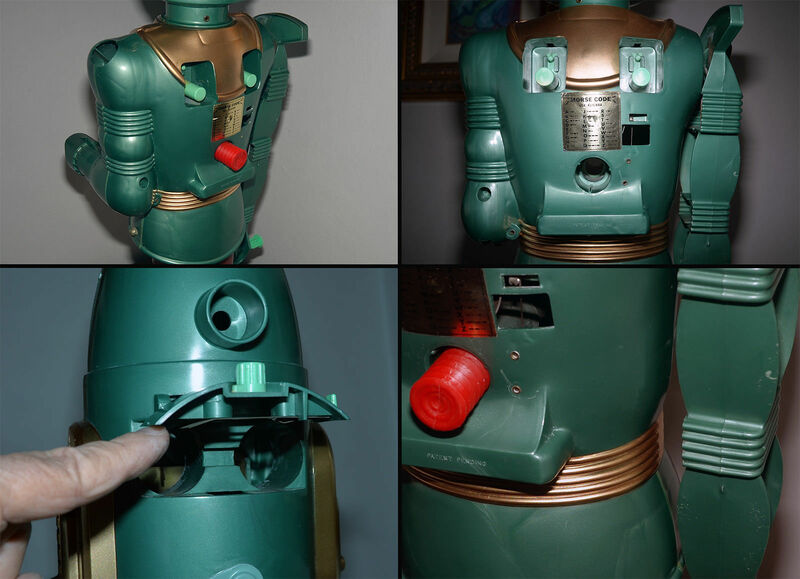 Turning to the rear of the robot, the original code sticker is in excellent condition, his bell still loudly rings and the hidden clicker is still present and functional. The Robot easily bends at the waist and the internal spring will easily pop him back to the erect position. The dual dart release levers are intact and in perfect condition. They are fully functional. As a side note, those owners who elect to demonstrate the launching of the yellow Space Rocket and/or his twin Darts are taking a dangerous risk. Because Big Loo’s plastic is now well over 50 years old, it can be extremely brittle. Those two action areas can be easy to crack or even snap a part. When I load the two Darts for display, I always slowly compress the internal springs until the click into place, but I never release the Darts using the rear levers without holding counter pressure on the front of the dart and gently lifting the rear release lever up. This prevents the release lever from snapping off. And with the yellow Space Rocket, I do the same thing with slowly compressing the spring for display but I never launch it on it’s own and risk breaking the green shaft. But if he is your Robot – it’s totally up to you! Big Loo’s head is in magnificent condition and the light green area around the mouth and eyes look fantastic. There is one very small blemish between his eyebrows. His famous smile/grin is still white and without missing plastic. His red eye light bulbs have been freshly installed and light brightly. They use the exact same vintage bulb from the 1960s era and they blink without issue. The twin battery compartments are rust free and show no sign of past battery leaks. His head still turns both directions and the side ear areas contain no broken vents. A reproduction Whistle fits correctly into the head’s top slot. The Whistle is non-operational is it is solid resin. Big Loo’s top gold crown is beautiful and without paint loss. 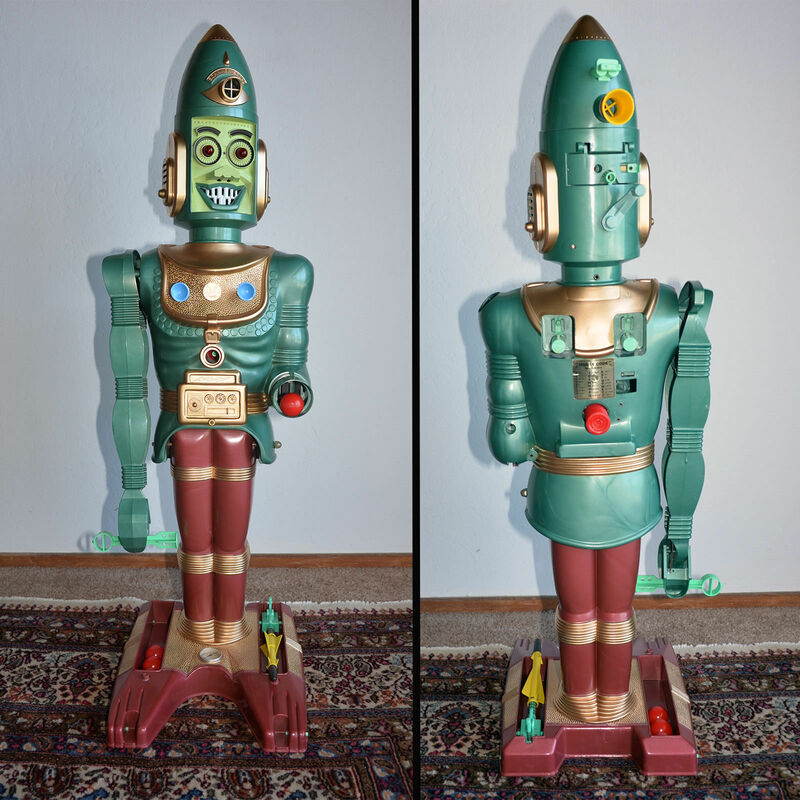 As mentioned in the auction title, this is a talking Robot which is rare these days and is one of the most sought after features. All 10 phrase can be clearly heard when cranking at the correct speed. The voice hand crank is a reproduction and we have provided several close-ups of this feature. We commonly find the voice crank broken off in the vast majority of Robots. 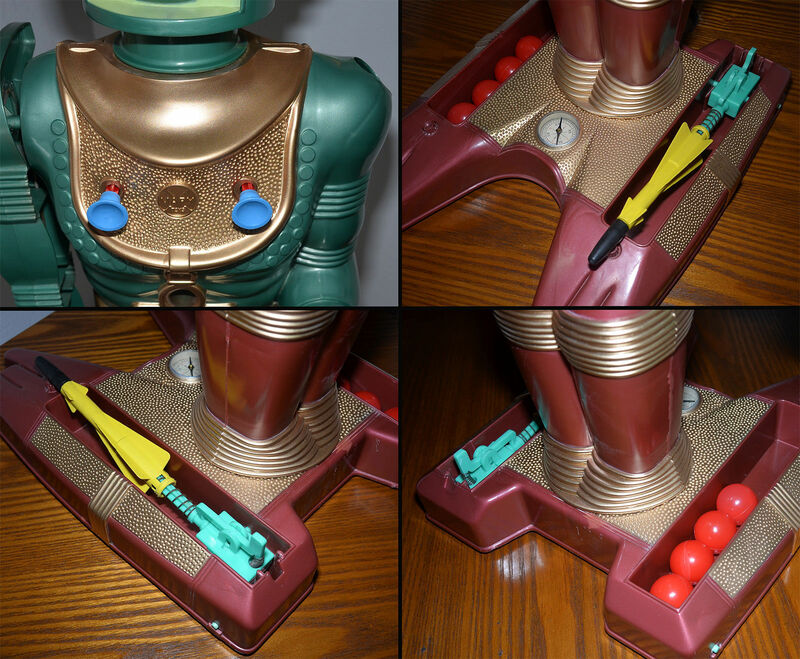 We believe that youngsters would get to fast cranking their Robots and impact the knob against the battery door knob directly above, breaking the handle.